US-China trade war: What should we do? While the US tries to halt Chinese technological advancement and retain its dominance, it is important for India to monitor the situation closely and see an opportunity for itself. India has ambitious digital targets at home. It is one of the biggest markets for technology and electronics companies for both the nations. In order to entice New Delhi, companies from both the countries are pledging to set up their manufacturing units in India. From Apple to OnePlus, the fierce competition to claim the Indian market is there for everyone to see. This is where India needs to walk a tightrope. It has to get the benefits of the business, rather than being seen as taking a side. India is actually in a position to dictate terms simply due to the sheer size of its market. The major concerns facing India are its oil imports, volatile neighbourhood and a growing population of educated youth looking for jobs. By cutting down on oil imports from Iran, India can balance its oil trade with strong US allies like Saudi Arabia and the UAE. While reducing Iranian oil imports pleases the US, India can have Washington negotiate better oil deals with its allies. Similarly, by offering a burgeoning domestic market to China, it can negotiate border security concerns and look for ways to rein in countries like Pakistan. In short, India needs to use its economic potential to strengthen its geopolitical standing. In the past, India’s pharmaceutical industry and the IT services sector suffered because of Chinese tariffs. The trade deficit between the two neighbours widened when Indian markets were flooded with Chinese goods and technology. India failed to make inroads into its neighbour’s market due to hostile Chinese policies. But now, China is looking at India as a lucrative market for IT services. Chinese companies are looking to start in India. This is where India can negotiate and export products ‘Made in India’ to China. Now, because of this trade war, uncertainty is prevailing. By closing economies, there will be no winner in this trade war in the long run. In a global economy where the free flow of goods turned local companies into global giants, local consumption alone will not be able to sustain either of the two big economies. Populist measures might result in short-term political gains. Grandstanding and retaliation might answer domestic concerns in the short run. But if and when companies start to incur losses, both the US and China would have to reverse their tariff hikes. In a trade war, unilateral action to impose tariffs has never been a successful strategy. China’s expansion plans are dependent on bailing out struggling economies. The major risk in plans such as the CPEC, the economic corridor it is building in Pakistan, is China’s hope that these societies and economies will turn around. Being the manufacturing hub of the world, China relies heavily on its exports. If these countries do not grow as the Chinese predict they would, Beijing’s investments may go bust. The US, an economy that has grown by going global, cannot risk closing itself and levying tariffs. It needs to constantly seek new markets and cannot afford to be seen as protectionist. What is emerging is a zero-sum game where a loss for one is a gain for the other and in the end, the probable winner—whoever it might be—will lose more than they win. India has to shield its economy by judicious domestic and international policies. We are witnessing a hue and cry over the dismal implementation of GST and purported benefits of demonetisation, and there are anxieties over the rise in wholesale inflation. Sudden evaporation of free cash from a large yet significant informal sector was a lethal blow to integrated economic sectors. All this has to be corrected as no grandiose vision and electoral promise will work if an already troubled economy gets hammered more because of turbulence in the external ecosystem. India needs to be a global spark in the days of economic gloom. We are at a critical juncture where we cannot let our demographic dividend that our government sells across the globe get impacted by narrow political gains. It is imperative that we let our economic growth and thriving society be our strongest selling points. 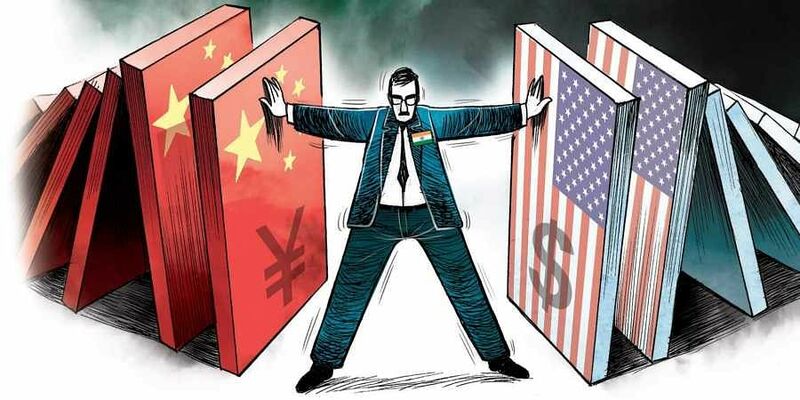 As the US and China fight it out, India needs to remain India to strike a hard bargain. And it should always remember, the reason it can do so is only because it is not Pakistan, Afghanistan or Sri Lanka.